The Vale Karoo Farm - Beaufort West Accommodation. 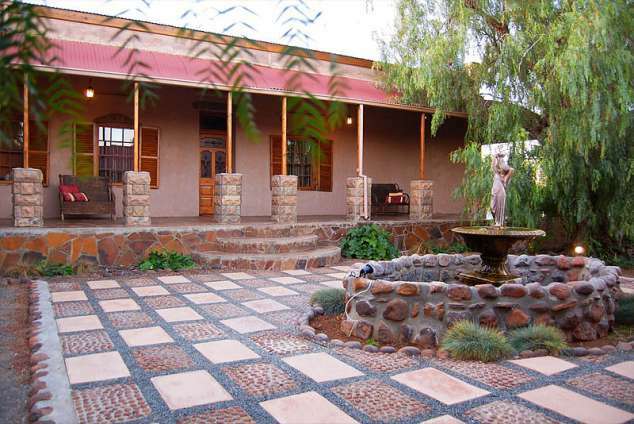 The Vale Karoo Farm lies at the foothills of the majestic Nuveld Mountains in the heart of the Great Karoo. It offers many new holiday and break-a-way opportunities on the farm. The farm is 30 km east of Bloemfontein and Cape Town ± 500 km each way. A new and exiting addition to the farm is the development of a number of leisure activities and accommodation facilities to cater for every taste and need. "The Vale" is a working Karoo farm and is one of South Africa's top Dorper sheep stud farms. Farming activities are diverse and include farming with substantial numbers of game. The Vale Karoo Farm offers many diverse accommodation facilities and after a long days "fun in the sun" or long traveling between Johannesbrug and Cape Town you can experience a good nights rest that fit your pocket and expectation. The lodge, expertly renovated from an old farmhouse from the 1880's to a luxury, highly comfortable Guest Lodge, has 5 exceptionally appointed en-suite rooms. Here you will be spoiled with excellent cuisine and homely service. There are 8 Twin bedded Rooms with its own en-suite bathroom and kitchenette. There are also 4 cottages with an en-suite double bed room and a twin bedded room with a kitchenette. You can even park your caravan or 4x4 right next to these stone cottages with its own braai area. Even spoil yourself at the excellent restaurant at the Guest Lodge. A beautifully converted old stone farm shed has become the Hunters lodge. Here you can stay in the comfort of the very affordable self-catering facility that can accommodation the whole family and even your friends! Enjoy unforgettable evenings in the Boma under the Karoo sky. 40858 page views since 29 Mar, 2007.